Unify your cross-channel data. Get recommendations for campaign uplift. All in 7 days at no charge. Our goal with the assessment is to provide you results you can immediately action to improve your digital campaign conversions, pipeline and/or revenue growth. 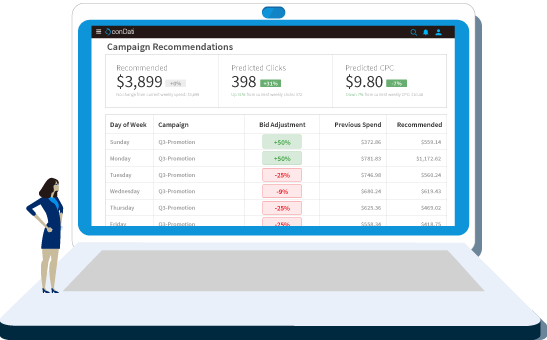 AI-driven recommendations that you can action to optimize your ad campaigns. ML-driven forecasting of your conversions, pipeline and/or sales revenue vs actuals. A unified report in PDF and live dashboard of your historical campaign data summary. Complete the assessment form request here. We will contact you shortly to schedule a kickoff call. * conDati platform activates within minutes, and delivers meaningful information in days.